Del Rio, TX-- The Del Rio Parks Foundation announced details today about it’s 2018-2019 Education Series. The series kicked off on October 11, 2018 with the popular Mystery Box Cooking Challenge and the next event, Coffee Brewing 101, is scheduled for October 27, 2018 at 10:00 am. 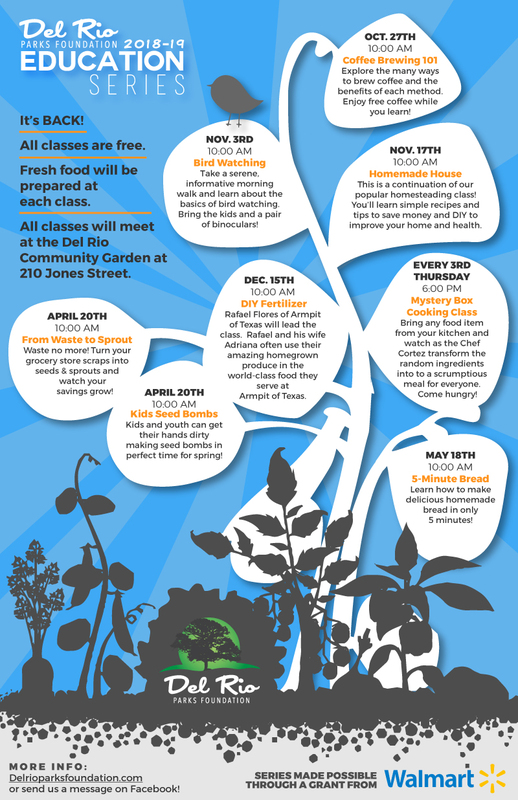 The Education Series sessions are hosted at the Del Rio Community Garden, located at 210 Jones Street in the historic San Felipe neighborhood. See full list of events on the Del Rio Parks Foundation events tab. The Education Series, supported by grants from Walmart of Del Rio, was developed by the Del Rio Parks Foundation with the goal of engaging local residents of all ages with informative and instructional programming designed to improve health and wellness. Coffee 101 - Led by local coffee extraordinaire, Natalie Granatelli of Branelli Coffee C. The class will explore the many ways to brew coffee and the benefits of each method. Enjoy free cups of coffee while trying out the brewing process yourself. San Felipe Bird Watching - Local writer and birdwatcher Karen Gleason, will lead a serene, informative morning bird watching class and walk. Bring the kids and a pair of binoculars! Homemade House - Minda Pfeil of Hudspeth River Ranch will present a class on homemade remedies and recipes. This class is a continuation of our popular homesteading class. Join us in this hands-on session and learn how to make items you use every day, improving your home and health! DIY Fertilizer - Rafael Flores of Armpit of Texas will teach a DIY fertilizer class. Rafael and his wife Adriana often use their amazing homegrown produce in the world-class food they serve at Armpit of Texas. The public is invited to learn how to make the very same fertilizer used to grow their abundant local produce. From Waste to Sprout - To ring in the spring, local farmer and food expert Maria Onofre will present a class on growing food from scraps. Seed bombs - Kids are also invited to get their hands dirty (and have fun!) making seed bombs. Easy Homemade Bread - Local chef and educator Adan Cortez will teach the public how to make delicious homemade bread in only 5 minutes at this educational cooking class. Mystery Box Cooking Class - Chef Cortez and students of the Del Rio High School Culinary Arts Program will cook up something delicious for dinner! Bring any item from your pantry or fridge to the community garden and watch as the Chef and his students transform random ingredients into to a scrumptious dish for everyone. Come hungry! The Del Rio Parks Foundation is excited to offer all of the Education Series classes free to the public, and refreshments will be provided at each session. To view the full calendar of events and find session details, visit www.delrioparksfoundation.com/educationseries or visit the events tab on the Del Rio Parks Foundation Facebook page. For more information about the Series or the Del Rio Parks Foundation’s other projects, please contact Foundation President, Laura Gill, at info@delrioparksfoundation.com or by cell at 612.850.5619. Del Rio Parks Foundation is committed to enriching the quality of life for the community through the development of outdoor park and recreational spaces in the City of Del Rio. We serve to nurture open space improvement opportunities by encouraging and mobilizing the financial support of neighborhood groups, foundations and citizens. Just want to help out when we need a hand? Or are you interested in being a part of our Garden Coalition—a hands-on get'er done group of volunteers who will manage the day-to-day activities of the garden? Members either rent a garden bed on a quarterly basis and are responsible for their plot, or agree to help on a weekly/monthly basis in exchange for produce.